The National Digital Strategy is an initiative by the government to help citizens, businesses and educational institutions embrace the opportunities that arise from using digital technologies and resources. The digital strategy initiative provides research, trainings and grants to help citizens, businesses and educational institutions advance and prosper using digital means. 1) Only 23% of small and medium sized businesses (SMBs) are e-commerce enabled. This means that only 23% of SMBs can sell their products or services online. For SMBs with less than 10 employees it is anticipated that this number is much lower. 2) Of all the purchases made online by people living in Ireland, 70% of these purchases are made via overseas websites. Opinion also suggests that people would buy more from Irish websites if the opportunity existed. To address the issue of SMBs (with less than 10 employees) not having a prominent online presence, the Online Trading Voucher Scheme has been launched as part of Phase 1 of the National Digital Strategy. The scheme offers SMBs across Ireland the opportunity to apply for a grant of up to €2500. This grant can be used to undertake a digital project to help them start or expand their digital presence. 2) Developing an e-commerce or booking component for an existing website to facilitate online sales and bookings. 3) Developing a digital marketing strategy. 4) Implementing a digital marketing strategy. 5) Marketing products or services online – up to 30% of the grant can be used to advertise on platforms like Google AdWords or Facebook. 6) Employing digital expertise and services like those offered by First Rate Digital to help with the above. You can read about the Online Trading Voucher Scheme in more detail on your local Local Enterprise Office (LEO) website. 4) How to use social media effectively. There were about 50 companies at the event. The level of interest in the scheme was high. Many of the people I spoke to were keen to apply for the grant. Some attendees appeared to have some expertise to undertake digital projects themselves. However many were keen to find assistance figuring out where to start with digital and how they would make the best use of the grant money. I’ll be assisting a number of the attendees that I met with their trading voucher application by formulating their digital strategy and helping them execute it. Interested To Know More Or Apply For The Grant? Contact Me Today. 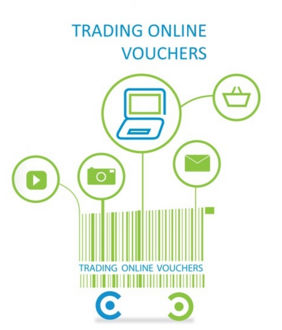 Would you like to know more about the Online Trading Voucher Scheme? If so please feel free to contact me and I can give you an overview. I can also give you advice on how to use the grant to expand your company’s digital presence in the quickest time possible.